Big dilemma more recently, I have no jeans. Not that I can’t go out and buy them, but I guess I’ve been waiting to be at my smallest or at my ultimate goal weight before the big ol’ shopping spree. What I noticed though, is that I need clothes… especially jeans, because it’s one thing to style big items to work for you (tying a belt vs fastening, rolling down jeans or cutting them), after a while you just look frumpy. So yesterday I stopped by one of those Rainbow type shops called Charade, where you can get like 4/$20 tanks etc., because they were having a “remodeling clearance sale.” Decided to try on a pair of “fake” jeans really- because they run on odd numbers, not a great denim, in a size 11. And, drumroll please…. they fit! Ever so slightly fitted, but they fit. 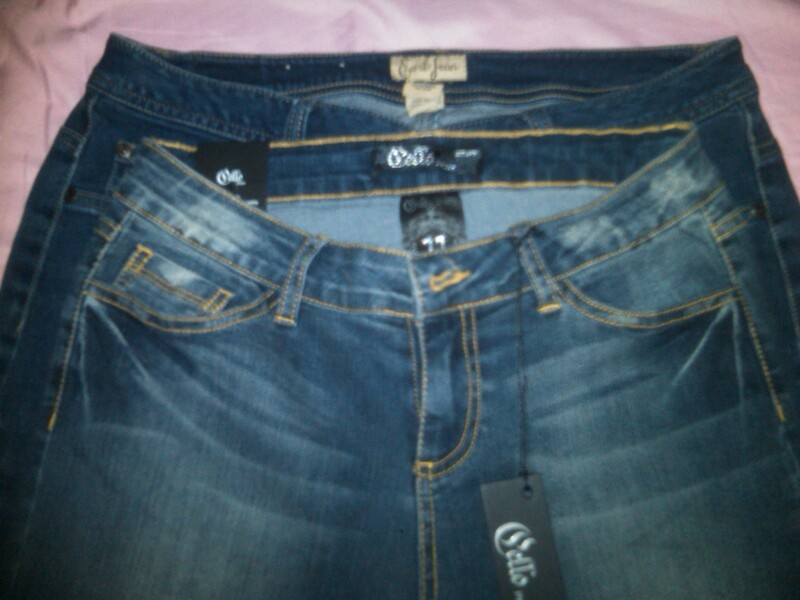 Now, check them out next to these fat jeans I had to by back in October of last year because I had ZERO jeans that fit. A VERY stretchy size 14- so we’re looking at more of a 16 maybe? The 11 has a diameter of about 28” (low rise) and the 14 (very high waisted), about 34”. If the size chart below is correct, we’re looking at a Small/Medium vs a XLarge. I’m a pretty happy clam. Again, while I haven’t reached my goal weight, I eat as healthy as possible and workout as much as I can. I will get there, and moments like these only push me to work harder! Thanks for the chart jeans-and-accessories. What moments have pushed YOU to work harder? SHARE below! Congrats on the skinny jeans! Jean shopping can be so depressing so its great to hear that after a bit of hard work it can be a really positive thing. Your pic has inspired me to keep hold of my current fat jeans so that I can hopefully take a photo like yours soon. Thanks so much! It’s been a lot of hard work, and I’m still working to lose the rest and maintain! We all have to try and A. be as healthy as we can be and B. look the way we want right? Best of luck on your journey too 🙂 I’m following!